Locals say that anyone who doesn't have Maine soil on their Carhaarts from birth is "From Away". We couldn't have been more excited two welcome to of our most favorites From Away to our wild Maine life this weekend. Caroline and I have known each other since we were little girls in Catholic School. I never could have imagined that we would reconnect after college when we were both single twenty somethings living in Charlotte, NC. We eventually became roommates and were out for a drink when we happened to meet a group of guys at a bar. Caroline met her husband, Reid, that night. Just a few short months later, I was introduced to Reid's college friend, Justin. Do ya'll see where this is going? Caroline and I wound up marrying bros/man friends/golf partners. Reid and Caroline couldn't wait to get up to Maine and experience a true Fall, snuggle baby Gray and spend quality time lying around my living room. There really is nothing quite like friendship that doesn't require work, pretenses or actual outfits. We played cards, had lazy breakfasts, watched football, devoured wings, dominated lobster rolls and consumed many bottles of wine. 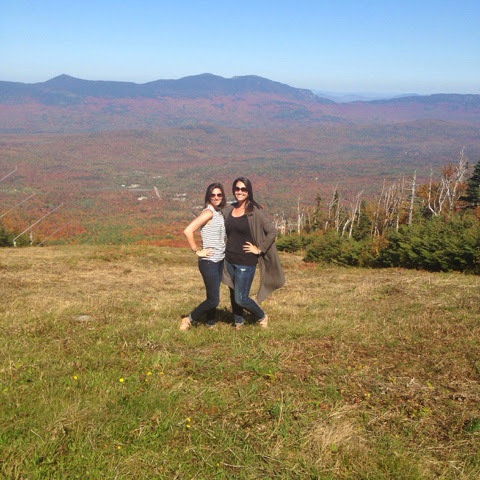 We pushed through the wine and chicken wing stupor and made it to both Bar Harbor and Sugarloaf Mountain to see the leaves in all of their Fall glory. Brace yourselves for a pic heavy post. I know it's a lot to ask for a Monday morning, but hang in there! It was an amazing weekend with some of the best weather that Maine has ever bestowed upon us. Thanks for making the trek up North, we miss ya'll already! Mimosa in a can? HELLO! Is that seriously a mimosa in a can? Where do I find that?? The pictures looks gorgeous. My husband and I don't live in close proximity to any of our old friends and visits are seriously the best things ever. Stunning photos and your story is just so cute of how you guys met/ reconnected and then found your soulmates! !